The latest vogue might be for colour lasers in the office but these are usually big, noisy beasts. 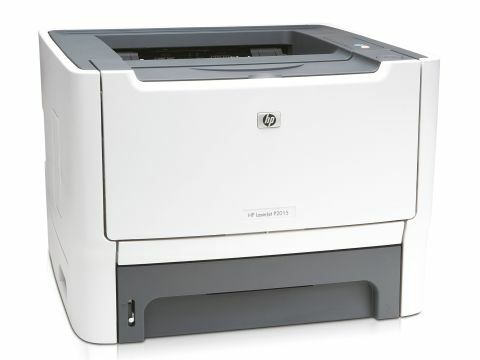 The new LaserJet P2015 mono printer is an exercise in space-saving simplicity. With an elegant design and simple controls that boil down to two buttons and a few status indicators, the P2015 looks positively streamlined. In time-honoured LaserJet tradition, fitting the toner cartridge is straightforward, while the main paper input tray, which slides in under the main body of the printer, feels robust and businesslike, complete with its mechanically-operated paper level gauge, making it easy to see how much paper is left. As well as the main, 250-sheet paper input tray, there's an additional 50-sheet multi-purpose input tray, that is ideal for envelopes and also comes complete with an extra slideout support so that full-sized letterhead paper or other specialist A4 media is kept fl at and fully supported when in use. The basic version of the printer is great, utilising 'instant-on' fuser technology for delivering single-page prints in under nine seconds. A4 document pages follow on rapidly at up to 26ppm. Graphics are handled speedily, thanks to a 400MHz Motorola ColdFire processor and 32MB of RAM, upgradeable to 288MB via a single 144-pin DIMM slot. Best quality mode ups the resolution to an impressive 1200x1200dpi, doing justice to detail. The basic version includes manual duplex facilities, via the printer driver. For an extra £35, the P2015d offers fully automatic duplex. Other models include built-in networking, while the range-topping P2015X, at £365, includes a second 250-sheet paper input tray. This tray is also available as an optional extra on other models for about £65 and running costs are low, with the Q7553A toner cartridge (including imaging drum) costing about £50, for 3,000 prints, working out at 1.67p per print. With its speed, ease of use and reliability, the P2015 is a chip off the old HP block, while its quiet operation makes it easy to live with.